As many as 43 exceptional female students were given the HH Sheikha Fatima Bint Mubarak Award for Excellence and received a year's scholarship. The awards were launched by Gems Education in 2005 and recognises female students in the UAE who have been nominated by their schools for their outstanding academic success, commitment to social responsibility and global citizenship work. 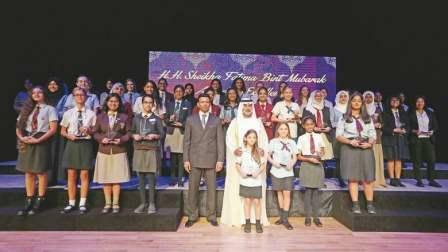 Sheikh Nahyan bin Mubarak Al Nahyan, Minister of Tolerance, presented the awards to the students at a ceremony held on Monday at the Gems Dubai American Academy. Laura Brynne Davies, a grade 12 student at the Bradenton Prep Academy, was one of the students who received the award. She bel-ieves her good grades and participation in various school activities earned her this honour. "Everything the Mother of the Nation (Sheikha Fatima bint Mubarak) has done for this country is incredible. She empowered women like no one has around the Middle East," the Canadian student said. "I really think this award tells girls not to just work harder in school, but to also be the perfect well-rounded student. You have to be good at sports and music to win this award, be active in the student government, as well as maintain good grades. It's about being the full package instead of just one component. Being that well-rounded student in this upcoming world is extremely important." Grade 9 student at the Gems Heritage Indian School, Richa Kewalramani also believes she won the award because of her involvement in various school activities, while maintaining her good grades. "It is an honour to win this award. I'm so thankful to my principal, teachers and my parents. This award definitely shows that women are capable of achieving great things and should be given importance," she said. Meanwhile, an Egyptian grade 10 student at the Gems Wellington Academy, Nour Emara, feels she won the award because of her charitable work in her home country and her participation in sports. Emara often travels back to Egypt and helps repair roads and repaints them, for the welfare of the citizens. "It's a great accomplishment, especially when you think you can never win such a prestigious award. I'm very proud of winning this award. I believe that all women should be given the opportunities to reach their potential," Emara said.